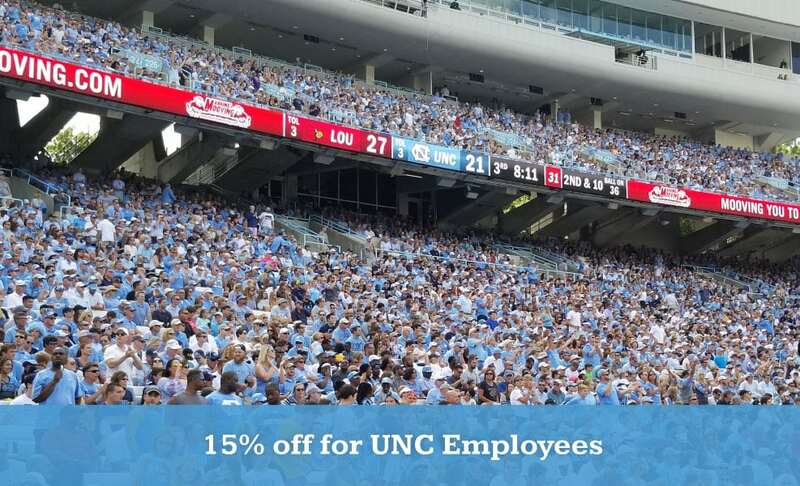 As a proud partner of the University of North Carolina at Chapel Hill, Marrins Moving offers promotions just for UNC-CH employees. That means if you’re planning a local or long-distance move any time soon, we’re your moving company of choice! We offer 15% off labor charges for all UNC-Chapel Hill employees! Take a look at the gallery below for other current offers and events. Marrins Moving has provided the best in moving services for almost 20 years here in the Triangle area. Over the years, we’ve proven why we’re the perfect choice for all Carolina staff and students alike. The bottom line is our dedication to every customer. With our fast, reliable service and attention-to-detail, your move will go smoothly every time. Call us at (919) 551-3530 or contact us for further information about our specials for employees of UNC-CH.